La Bergerie de Sanorgue offers up to 10 guests the chance to experience an eco-friendly holiday in the heart of the Baronnies Provencales Regional Park. The region benefits from 300 days of sunshine per year! Once a working sheep farm, La Bergerie now provides the perfect, nature-friendly base to explore an unspoiled and largely unfrequented corner of France. 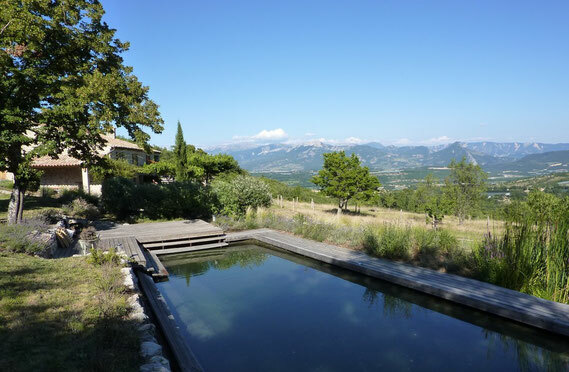 Perched on a south-facing hill and perfumed by 10 acres of wild thyme and lavender fields, La Bergerie features a chemical-free, natural swimming pool, a shaded terrace with a spectacular view of the surrounding foothills and front-row seats for star-gazing under Europe’s purest sky. At La Bergerie, serenity reigns even though the village of Ribiers, where you’ll find all essential amenities, is a brisk walk away.